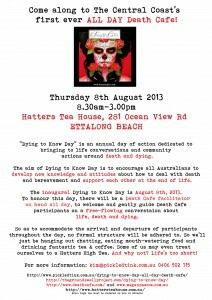 What: Dying to Know Day encourages all Australians to take action toward more open and honest conversations about death, dying and bereavement. Inspired by the Igniting Change book, Dying to Know, D2K Day is a not for profit community day of action initiated by The GroundSwell Project. We believe there is a HUGE amount of unharnessed death-related knowledge in the Australian community. 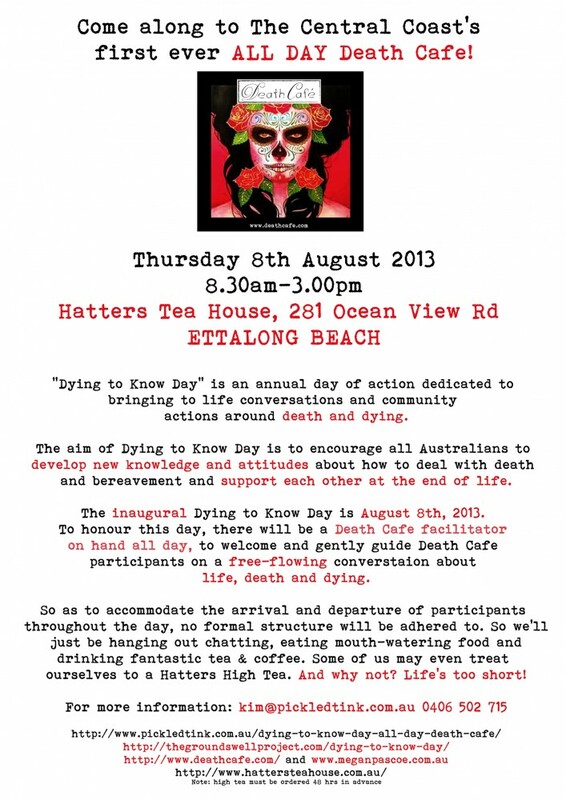 Dying to Know Day provides a way for people to share knowledge and become better equipped to deal with death! What do we know about death in Australia? We undertook an online survey in June asking about knowledge and experiences related to death. 100 people participated. People rated their knowledge as low or none 50% of the time about shrouds, natural burial grounds and DIY funerals. 60-85% of respondents said they were comfortable or very comfortable talking about a number of topics including their own death/dying, making funeral arrangements, offering support to the bereaved and talking to someone about their cancer diagnosis.